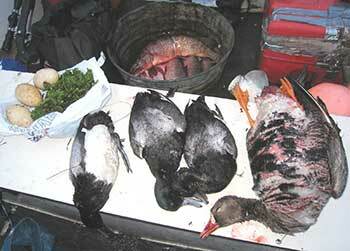 The Alaska Migratory Bird Co-management Council (AMBCC) was formed in 2000 and comprises representatives of the U.S. Fish and Wildlife Service (USFWS), Alaska Department of Fish and Game (ADF&G), and Native Caucus, which includes Alaska Native representatives from each of the 10 subsistence regions in Alaska. The AMBCC provides recommendations to the Pacific Flyway Council, U.S. Fish and Wildlife Service, and others for the annual spring-summer subsistence season in Alaska and other topics related to the conservation and harvest of migratory birds. The subsistence harvest of migratory birds has been monitored since the mid-1980s using voluntary household harvest surveys. The AMBCC Harvest Assessment Program (AMBCC-HAP) started in 2004 and relies on collaboration among the USFWS, ADF&G, and diverse Alaska Native organizations and individuals. The survey is approved by the federal Office of Management and Budget (control number 1018-0124, expiration date 10/31/2019). Continued harvest monitoring allows tracking trends in harvest and supports engagement of subsistence users in harvest management and bird conservation. Beside the regular annual harvest survey, the AMBCC-HAP also conducts research on harvest-related topics to address specific management and conservation issues. The ADF&G Division of Subsistence implements the Harvest Assessment Program on behalf of the AMBCC. The AMBCC-HAP closely coordinates with the AMBCC Harvest Survey Committee.